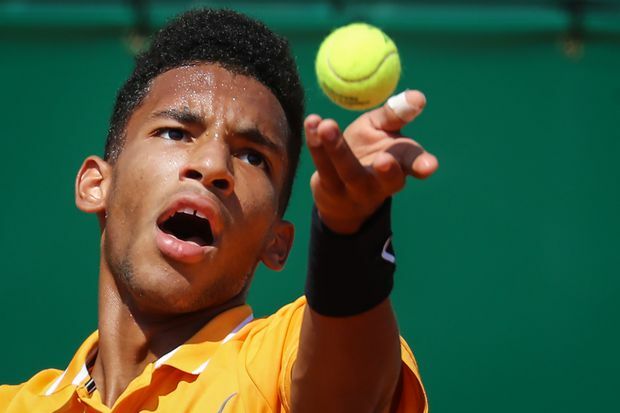 Felix Auger-Aliassime serves the ball to Germany's Alexander Zverev during their second-round match at the Monte-Carlo ATP Masters Series tournament on April 17, 2019. Back on his favourite surface, Rafael Nadal showed no lingering effects of a recent injury as he breezed into the third round of the Monte Carlo Masters on Wednesday with a 6-1, 6-1 win against Roberto Bautista Agut. Nadal was making his season debut on clay and playing his first match since suffering a knee injury at Indian Wells a month ago, but the defending champion looked sharp from the start and secured an early break of serve for 2-0. Aside from having to save five break points across two games – at 0-40 down in the fourth game and at 15-40 in the sixth – Nadal was otherwise untroubled by his Spanish compatriot. The 17-time Grand Slam champion converted his first match point when he met his opponent’s strong forehand with a crisp volley at the net. Nadal is looking to win the clay-court tournament for a record-extending 12th time and next plays Grigor Dimitrov, whom he has beaten 11 times in 12 matches. One of Nadal’s wins against the unseeded Bulgarian was in last year’s semi-final. The third-seeded Zverev made 75 per cent of his first serves, compared with 52 per cent for Auger-Aliassime. Zverev also held a 6-2 advantage in service breaks. Fritz won 6-4, 6-2 against Diego Schwartzman and the 21-year-old American next plays top-ranked Novak Djokovic.